Almost 3,500 people in Uruguay have had to leave their homes after heavy rains caused flooding in large parts of the South American country. 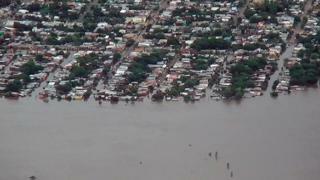 Uruguay's defence minister said the army, navy and air force were helping with the evacuation. The region is no stranger to flooding. In December 2015 more than 150,000 people in Paraguay, Argentina, Uruguay and Brazil were driven from their homes by some of the worst flooding in decades.